Life Before the Dinosaurs: Archimedes. 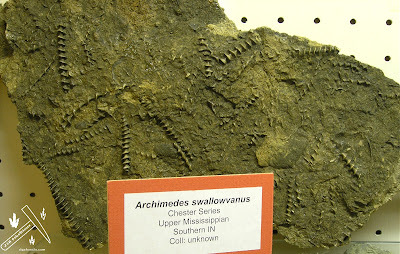 Archimedes (bryozoan) is an extinct animal that lived from the Carboniferous to the Permian Period. Archimedes had a spiral wall that wrapped around a corkscrew stalk that was anchored to the sea floor. The wall was covered in zooids, like all bryozoans. Archimedes is named after the Archimedes Screw, because of the corkscrew stalk. Most fossils of Archimedes do not preserve the spiral wall. Instead they only preserve the unusual stalk. Archimedes is unique because of its spiral shape. 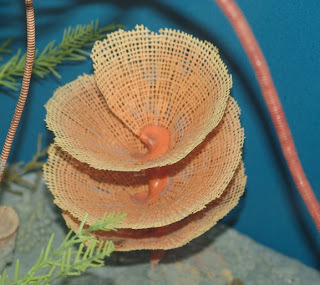 It is a kind of animal called a bryozoan, which means "moss animal." They are also commonly called "moss animals," and they are still alive today. But Archimedes has been extinct since the Permian. These fossils of Archimedes only preserves the corkscrew stalk. The rest of it is usually not preserved because it is very brittle, like all bryozoans. You finally posted about something I actually found where I live! I found tons of those Archimedes fossils all around my house when the subdivision was under construction. I live in Ballwin, MO (Near St. Louis) and the rocks my fossils were in had way more iron content that the above picture (white and red colored). I know this post was a while ago, but I would love to find some Archimedes screws and I live in Ballwin. Any ideas of where to look... and do you have any of the ones you found I could see? My name is Ray and my e-mail is rayfa42@yahoo.com. THANKS! That's amazing that you found so many of those! I can't until I get to find my own fossils. I was pretty much your age when I started digging around looking. I found a lot when the subdivision I lived in was being constructed. Every time a basement was dug up, I would find all kinds of rocks with fossils in them. I don't know what area you live in, but if you can find a place along side a road where they dug into a hill, thats a good place to look (with the aid of your parents to drive you). Any cliffs in the area also usually have interesting rocks.